Welcome to the cocktail reception of the 12th Asian Financial Forum. After a long and rewarding day, you all deserve a refreshing pause. Now is a good time to slow down and chat with some of the more than 3 300 business leaders and investors, government officials, academics, regulators and professionals from all over the world, here in Hong Kong for this two-day financial summit. Now is a chance, too, to digest some of that invaluable financial intelligence and insights you've heard today, while making plans for tomorrow. If you haven't already done so, I recommend you pay a visit to the Fintech Showcase newly launched this year. With financial innovation continually reshaping and reimagining the global marketplace, the FinTech Showcase features the latest fintech solutions, as well as the companies and entrepreneurs behind them. You can see from there the shape of the future, explore business opportunities and invest in your own future. That, of course, is what the Forum does so well. What Hong Kong is renowned for. Bringing people together, creating connections, finding ways to excel, at local, regional and global levels. Hong Kong has long been the international financial bridge connecting the Mainland and the rest of the world, bringing investment, capital, ideas and talent together. In a world today buffeted by trade clashes, Hong Kong remains open and inclusive, embracing challenges as opportunities. Our markets remain open and welcoming. Our legal system is built on the rule of law and buttressed by an independent judiciary. Information flows as freely as global capital. And our regulatory regime is transparent and aligns with international standards. In short, you can count on Hong Kong, on our status as one of the world's leading international financial centres, and China's international financial capital. We take pride in our place and achievements in the global economy. And we are determined to build on them, to expand our role as the go-to economy – with financial and professional services that embrace the traditional and the innovative, the global and the local, the corporate and the start-ups. It's why, last year, the Government implemented a new listing regime, enabling the listings of companies from the emerging and innovative sectors. It's why, just a few months ago, we launched the Faster Payment System, which allows the public to transfer funds anytime, anywhere, across banks and stored-value operators, almost instantly. It's why we will, very soon in the coming months, announce Hong Kong’s first batch of virtual bank license. Looking ahead, I can tell you we will take full advantage of the opportunities that China, the world's second-largest economy, presents. That, ladies and gentlemen, very much includes the Guangdong-Hong Kong-Macao Greater Bay Area development and the far-reaching Belt and Road Initiative, as well as the financial services, investment and business promise they offer Hong Kong today and long down the road. As for tomorrow, day two of the Asian Financial Forum, the agenda will be led by financial technology and the boundless prospects they offer us all. The InnoTalks series tomorrow spotlights a dazzling range of transformative technology, from fintech and blockchain to cyber security and AI. Then there's InnoVenture Salon, which includes a start-up zone showcasing some 50 start-ups, and their products and concepts. The Salon also features Investor Alley. There, start-ups get to pitch their ideas – their future and of course ours – to investors at project demonstration sessions. Now in its second year, the Salon is supported by some 60 investment mentors. This year, we welcome new collaborators from Germany, Korea, Singapore and the United States, all eager to meet with participating start-ups. Those looking to find an investor also turn to the Forum's annual Deal Flow Matchmaking Session. 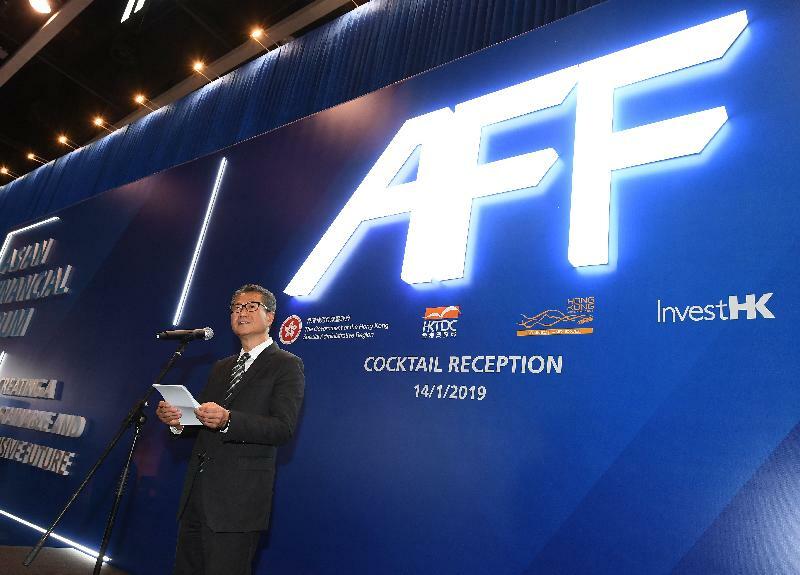 Last year, more than 90 per cent of Deal Flow participants found AFF Deal Flow effective in identifying potential deals and investors. This year, I'm told, nearly 700 one-on-one meetings have been arranged, the majority of them taking place tomorrow. I’d say that adds up to a full and, no doubt, fruitful day. Ladies and gentlemen, I know you will enjoy this evening's well-deserved break. I wish you the best of business at the Asian Financial Forum, and a happy, healthy and prosperous 2019.